Impact LS-K4 Micro Kit Stand - 48"
The Manfrotto Backlite Mini Kit Stand is a versatile, hardworking, lightweight, aluminum stand. It is quick to set up, and very stable. It features a black anodized finish, plus a removable 1/4"-20 threaded tip that reveals a 3/8" threaded tip on the top 5/8" Baby top stud. For lightweight fixtures, in small work areas. Box Dimensions (LxWxH) 16.3 x 3.8 x 2.9"
156BLB Black Mini Kit Stand - 4' is rated 4.9 out of 5 by 32. Rated 5 out of 5 by Watson W. from Best Mini Stand! I often get hired to field record sound effects in various locations. When collapsed, this mini Manfrotto stand can fit inside my backup next to my microphones and field recorder. It can be raised high enough for most recordings (and for lights). Moreover, it is strong enough to hold a windshield kit housing a microphone inside. Only thing I don't like is that the legs can't fully extend out, like the Manfrotto 5001B stand can. Other than that, it's The Best stand if you need to be portable. I HIGHLY RECOMMEND this Manfrotto stand!! Rated 5 out of 5 by Photos in NH from Great Mini Stand The stand is lightweight and durable. Very short when closed for carrying. It is characteristic of a Manfrotto product. I use it for placing Nikon SB lights. I am not sure it would hold heavier strobes. Rated 5 out of 5 by Jason from Great for a background stand I bought this, although a little nervous about doing so, because of the max weight limit, for a background monolight. I never ended up using it for a monolight, as I ended up buying speedlights instead...so I'm still not sure if these could support a full monolight. Maybe at the minimum height, because the overall footprint on this guy is pretty small. For a speedlight, it is perfect though. Compact, and small, it allows you to use it behind your subject to light the background, or to even provide rimlight from behind if desired. Rated 5 out of 5 by Anonymous from perfect background light stand It's amazing how low and how high this small stand can go- which is more in both directions than my floor stand (012B). It also has a small footprint which makes it easy to hide behind subjects. I'm sure it will provide years of service as it seems as well built as all the other manfrotto stands I own and use. Rated 5 out of 5 by Patricia from My third Manfrotto This is a great, sturdy, little stand. I use if for backlight. I use two bigger ones for umbrellas and a small soft box. The 4th stand I bought was a heavy duty Impact. In less than a year, 3 pieces have already cracked off of it. And it was hard to use. I'm sticking with Manfrotto. Rated 5 out of 5 by Studio Fuentes from Little Stand Big Support I usually give a 4-star rating to the best items because there is always room for improvement, but this little guy is top-notch. It is stable and strong. I've exceeded the weight on it a few times already and it has held up with no tipping. If you use Speedlights and umbrellas outdors you will have issues with wind (but nothing that you wouldn't encounter witha larger, heavier stand). Plus because it folds down so small and weighs next to nothing you can haul a few of these around and set up complicated lighting scenarios without assisstance. Rated 5 out of 5 by Anonymous from Small but sturdy I'm using it as a background light stand. It holds an Alien Bee just fine. Rated 5 out of 5 by Geo from Sturdy and Stable Well built as you would expect from Manfrotto. I use this to support Profoto B2 and B1 heads mostly for background lighting. It handles a B2 perfectly. It's also sturdy enough to support a B1 head, just gotta be more careful...common sense really. Because the legs are so short, the stand can be a bit tipsy when fully extended with a B1, so use a sandbag. At its minimum height a B1 is fine. 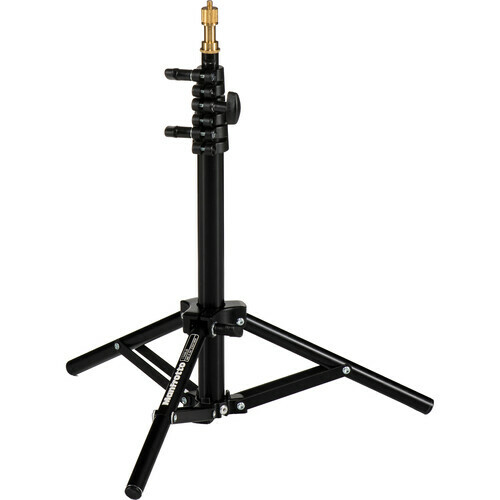 Would this be sturdy enough for a Broncolor Siros monolight for when I need at a low height? Are the joints made of plastic or metal? I have a 156 BLB - made from lightweight aluminium.I love it.